Here we are, on my favorite day of Book Blogger Appreciation Week – interview swap day! Allow me to introduce Elizabeth, of As Usual, I Need More Bookshelves. Isn’t that blog name genius? I think that exact thing to myself every couple of months. Elizabeth has kindly answered my questions (and if you read through to the end, you’ll find a giveaway!). You can check out my answers to Elizabeth’s interview here. I'm a wife, mom, sister, daughter, friend, and avid reader. I don't feel like I have time to be any of them enough. My life tends to be completely crazy, and yet it's the best life I could ask for. Self-help. I can't stand them. Those types of books make my teeth grate. And I don't technically REFUSE to read westerns, but I honestly can't remember the last time I did. I think carrying two two-year-olds up and down a flight of stairs without dropping them counts as a superpower, right?? Two of my favorite heroines are Anne from the Anne of Green Gables series, and Katniss from the Hunger Games trilogy. I'd love to have them both together for an evening - Anne is all hopes and dreams, and Katniss is all down-to-earth practicality. I don't know if they would love each other or detest each other, but I'd love to get them together. We could have an "Iron Chef" party - the secret ingredients could be rabbits and brown sugar, and I bet the results would be hilarious! Huckleberry Finn. Ulysses. The Five Agreements. You MUST read The Lions of Al-Rassan. It's fantasy wrapped in history wrapped in an incredible love story. My mom (who doesn't read fantasy) even liked it, and it's the novel I want to read over and over again. You MUST visit BookLust - http://www.aartichapati.com/. Aarti is constantly reading something that sounds interesting, and I've read some fantastic books by following her recommendations. I don't have time to read nearly as many blogs as I'd like, but hers is one I keep up with whenever possible. One thing you should NEVER say to strangers - So, what do you think about the current vampire situation in Congress? Thanks Elizbeth! I think your superpower definitely counts, and wouldn’t you know it, I hate self-help books too. I haven’t read The Lions of Al-Rassan, but I’m convinced I should give it a try – and so should everyone visiting! 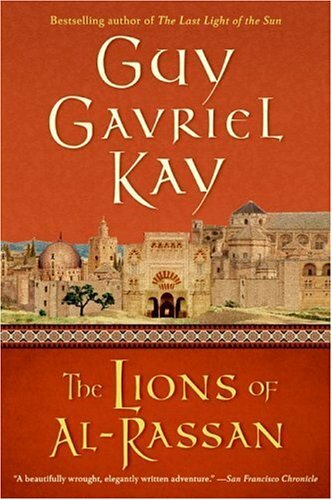 If you’d like to win one paperback or ebook copy of Guy Gavriel Kay’s The Lions of Al-Rassan, simply fill out the FORM. Giveaway open internationally, will end on September 15, 2012 at 11:59pm EST. Winner will be selected randomly and notified via email. Good luck! Y'know, I'd be totally willing to say that to strangers. I have a Guy Gavriel Kay book that I bought, but I've actually never read anything by him. I'm so glad to see someone else who loves The Lions of Al-Rassan. Depending on my mood it's tied for favorite Guy Gavriel Kay novel with, Tigana and A Song for Arbonne. A wonderful interview! This is such a great way to learn about the person behind the blog. A dinner party with Anne & Katniss would certainly be fun! Wonderful interview!! I am learning so much about fellow bloggers! I am going to check her out. She is new to me!! Best giveaway ever!! Thanks so much for being such a fun interview partner - you will definitely see me stalking your blog in the future! And yes ma'am that is a super power!!! Anne is a great heroine! I just read Anne of Green Gables for the first time this year and was so surprised that I enjoyed it as much as I did. Oh, I love I Capture The Castle -- such a rich, lively and wonderful book! I agree about self-help...not for me. Great interview, I follow her now. And thanks also for the recommendation. Even if I am not lucky enough to win the giveaway, I will have to check the book out. Wonderful interview -- great questions and thoughtful answers! Great interview! I'm pretty much sold on The Lions of Al-Rassan. Sigh. Another to add to the TBR! Fun questions!! I'm not familiar with Elizabeth but I love her blog title. And I totally agree that carrying toddlers up and down the stairs equals a superpower. Great interview! I've followed Elizabeth's blog for a long while now. She's such a great person. It's nice to meet you too, Cecelia! Agreed, genius name for a book blog! and also, I completely agree, Guy Gavriel Kay's The Lions of Al-Rassan is a truly amazing read, certainly one of Kay's masterpieces.